Use an electric mixer to whip the butter until it's soft, then add the condensed milk and whip thoroughly until creamy. Place the mixture in the refrigerator while you prepare the rest of the ingredients. Place the almonds on a flat dish and toast in the oven for 10 minutes. In the meantime and keeping an eye on everything, use a quesillera to cook the sugar at medium heat. Don't stir. When the sugar begins to melt and turn into caramel, carefully use a towel or silicon mitten to move the mixture from side to side in circles to allow it to melt evenly. When the caramel has completely melted and browned, remove from the heat and carefully spread out in a tray to let it cool. Once cooled, tap the tray on a flat hard surface to break the caramel into pieces. Place a layer of almonds and caramel in a square or rectangular heat resistant dish, lightly soak each ladyfinger in milk and add a layer of them to the almond mixture. Remove the cream from the fridge and use a spoon to spread over the ladyfingers. Complete two layers and finish with the almonds and caramel. Cover with a vacuum-sealing lid or with plastic wrap and freeze for an hour and half, or until the cream thickens. Remove from the freezer 10 minutes before serving to let it thaw out a bit. You can prepare the caramel beforehand and store it in a cool place until ready to use. You can add some drops of almond liqueur to the milk, if you'd like. You can store this dessert for up to one week in the fridge. I've always felt that when you do a good job or reach an important milestone, you deserve to reward yourself. Don't wait for someone else to do it. You know yourself better than anyone else and you know what you like. You should do the same with your loved ones. When your kids do well in school, for example, reward them with something they love. This is the best way to celebrate their success. When my favorite team wins the match, I get so excited that I feel the urge to award myself for their win. There's nothing better than a creamy almond Marquesa… just ask anyone in my house. 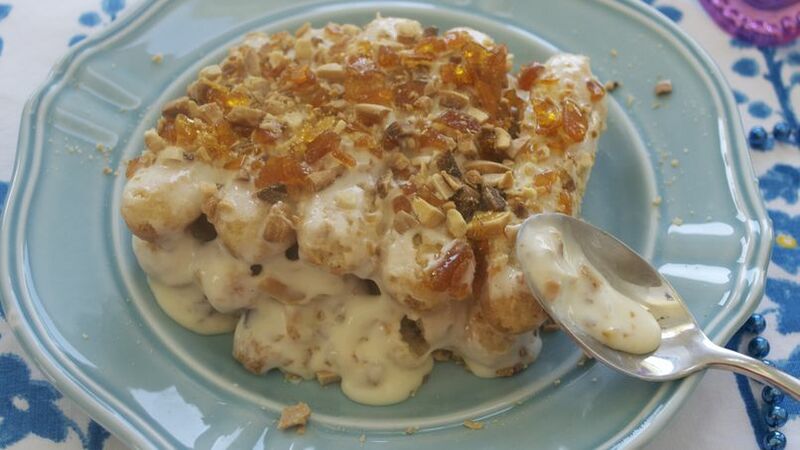 It's made of layers of ladyfingers covered in cream, almonds and caramel. It's the perfect way to celebrate your excitement and happiness. Here is my recipe to help you harness your absolute happiness. Remember that laughter is the best food for the soul.